Upgrading a SQL Server instance to 2017 has some changes. The first big one has to do with Reporting Services (SSRS). 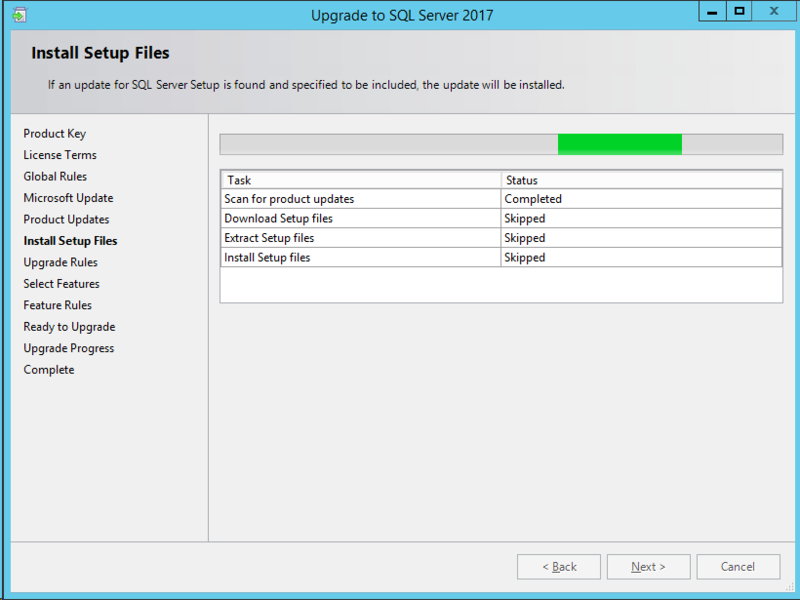 The installation program no longer installs SSRS and suggests to upgrade before the in place upgrade of the engine and/or Analysis Services (SSAS) is performed. I really like how the Product Updates and instal Setup Files screens do not even show up if everything passes. Here is a screen from the upgrade path. Notice the check box Uninstall Reporting Services. I’ve migrated my reports. 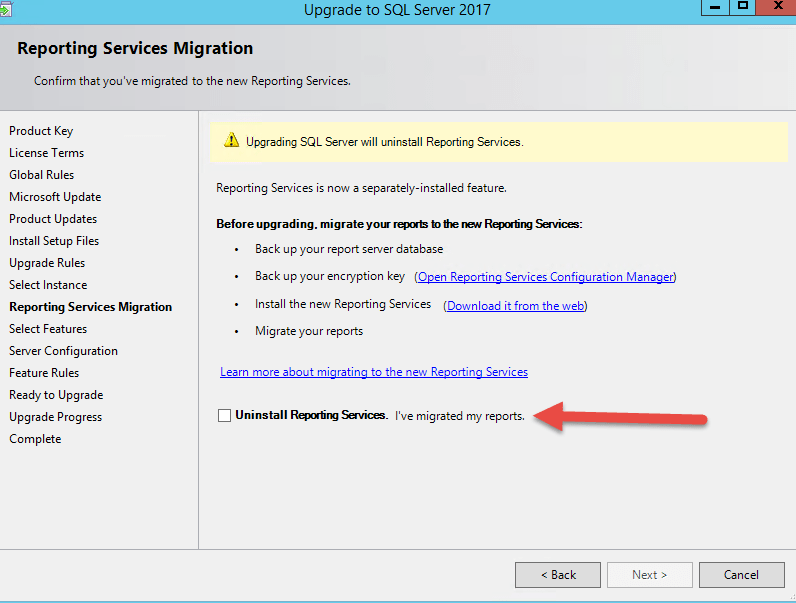 What this is saying is you can upgrade reporting services before (or after) running the full upgrade to 2017. It is also a WARNING!!! SSRS is about to be uninstalled SO!!! backup your SSRS database, encryption key and install from a separate download. 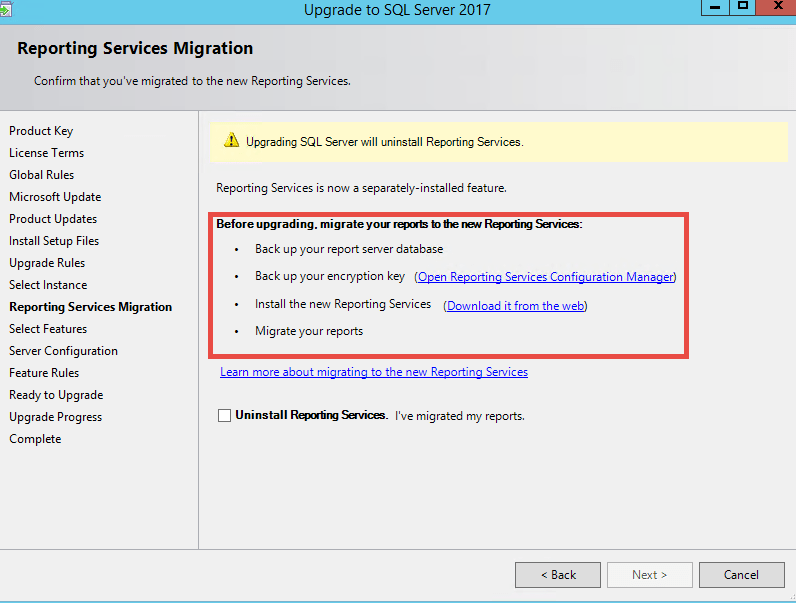 The Reporting Service Configuration Manager will handle the migration. The configuration manager for SSRS also no longer has the version in the menu choice. We did this except we installed the Power BI Reporting Services first and migrated existing 2014 SSRS reports to this new Enterprise or Permium Subscription version. It is really nice for posting Power BI reports to SSRS Portal.